My Christmas cactus burst into bloom. Absolutely gorgeous. And amazing - a houseplant of mine is actually blooming rather than shriveling up before my eyes. The weather has been grey, dull, and rainy/misty until today when the skies cleared and the sun came out, instantly lifting my spirits. I've begun wrapping the presents. It always amazes me how time consuming this task is, but I find if I do it a little at a time then I can relax and enjoy the process. A small glass of apple liquor sipped slowly while wrapping also helps with the relaxation aspect of things, just saying. My favorite pajamas - with giraffes on them - have ripped beyond repair. Tomorrow is the last day of school before Christmas break and I am looking forward to not having to pack lunches for two weeks. I've been considering choosing a word/theme for 2016....more to come on this, maybe. 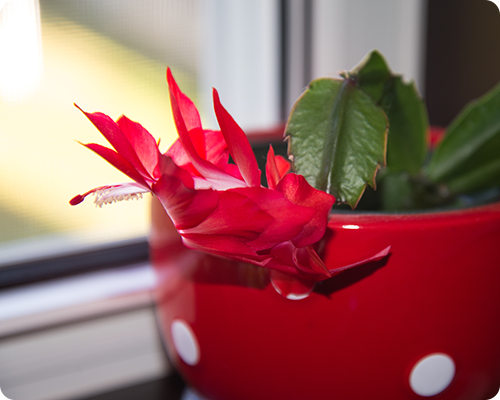 Your Christmas cactus is just pretty. Love your list and you sound very organized. Have a wonderful Christmas.